What to do if your web hosting has been down for a long time? What to do if your website goes down and you are not sure whether it will go live within a few minutes? Definitely you will contact the hosting's technical support and ask them to resolve the issue. but what if the technical team fails to give you a deadline to resolve the issue? Would you leave your website in that case? Generally it doesn’t happen if you are using a reliable web hosting. But things may really go awry if you have hosted your website with a cheap VPS provider. Cheap VPS providers have been notorious for their servers's going down for several hours in a row. Another weird situation arises when your website becomes unavailable during peak hours of traffic. You may lose big money for these unwanted and unforeseen down-times. Technology is growing exponentially and more and more renowned hosts are using the ever-upgrading versions of it. So, their servers now almost never go offline. That said, we cannot completely exclude the possibility of any server's going down. That's what we call bad luck. Additionally, several times, data centers may be down due to technical issues or power issues. If reports are to be believed, some VPS servers become down for days on end. After 2-3 days, site's search engine ranking starts wobbling. It is worse to sit around and see the horrible situation developing. So what would you do to get your website out of this jam? As a matter of fact, there is no plain and clear-cut answer to this question. Wait a minute, here is my solution, which on the face of it, may seem a little roundabout, but believe me it will surely work for long down-times. 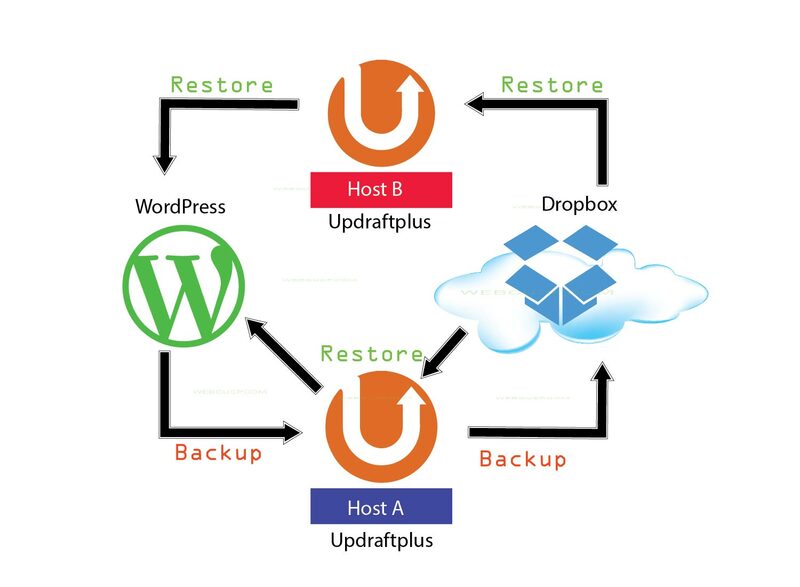 Log in to your WordPress and install UpdraftPlus free backup restore plugin. Note– Don’t buy alternative host from a sister company of your main host as they may share datacenters. you need an alternative hosting account purchased from a company other than your main host. For example, if you have your site hosted on A2 Hosting, buy a hosting account from a different provider such as Arvixe or any other one which you think in a good light. Sign up with your website domain that is currently setup with A2 Hosting. Login to your newly bought hosting account and install WordPress on the main domain. Once the domain is setup with new (alternative) hosting, login to WordPress. It is a fresh WordPress install. Install Updraft Plus plugin and connect it to your Dropbox account where you have setup backup of your WordPress website using UpdraftPlus. In doing so, your WordPress website gets live on this new hosting. One alternative host, Login to your WordPress and restore the latest backup from Dropbox using UpdraftPlus. Voila, that is the way to go! Your WordPress website is live even when your main host is down. When your main host recovers from the downtime, simply switch your domain back to the main host. How to know whether your main host is up again? To check whether your main host is up again and doing well, you can use your main host’s server IP. To know what your server IP is, open the email which hosting company sent you after your signup. Most probably, you can find your server IP's information there. If you are unable to find your server IP in your account information email, try logging in to cPanel. If you are unable to log in to cPanel that means your hosting is still down. If you are able to log in to cPanel, you can find the server IP somewhere in the left information bar. Copy this IP and check it with check-host.net. If check-host.net resolves the DNS, your main host is up, or else it is still down. use a free (or paid if your budget allows) uptime reporting service. I will recommend statuscake.com that offers an uptime monitoring service fully free for as many websites as you want to add to monitor uptime. In its free plan, this service crawls your website every 5 minutes and when it finds the site down, triggers an email or a SMS (if you have SMS credits) notifying you about the down-time. That's the quickest way to know whether your site is down. Once you are aware about the downtime, you can start rescuing the website from this terrible traffic-losing status.